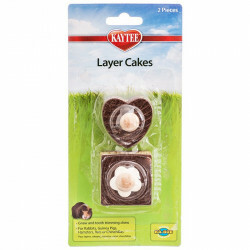 Kaytee Knot Nibblers are balls of fun for small animals. Pets will nibble and gnaw the wooden chew toy, eventually reaching the fun wooden ball inside! 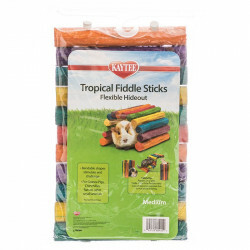 This versatile chew treat is made from all natural wood and safe vegetable food colors, making it a perfect chew toy for rabbits, guinea pigs, hamsters, gerbils, chinchillas, pet rats, and other critters! Bunny Greyson was so cute when the boxes arrived from Pet Mountain. It was as if he knew the contents were for him. His favorite new item was this Knot Nibbler. It actually entertained him for several days until he chewed it apart. Next time I will purchase several in both sizes. This is a very cute toy but our guineas aren't interested in it. My little rat-brat loves these things. He tosses them around and nibbles them. Highly recommended. Roger Rabbit finally started wearing out the original one of these I bought so got him a new one as back up. He loves to toss it around his room and have me laugh and make over his antics. Great product. Tasty treat for our hamster! Our hamster loves to chew and enjoys this nibbler! 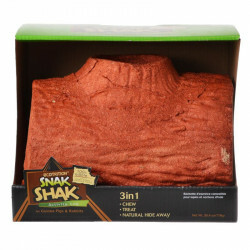 I ordered this for just 3 of our 9 rats to see if they like it and they went crazy for it! Two of them had it apart in about four days and the other two are still chewing on theirs. 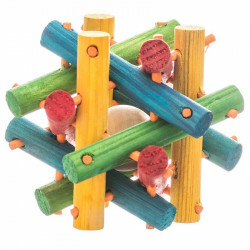 This is a great toy to keep them busy so they don't just sit around. I will be getting some more of these. I might get the bigger size for the two that had theirs apart quick. I would recommend this for anyone with rats or other chewing animals. Great product. My guinea pigs love it!